The Boston Redevelopment Authority approved a 15-unit residential project located at 333-339 West Broadway in South Boston. The five-story project, being developed by Paul Adamson and Mark Cummins of South Boston, will contain 15 condos of which two will be affordable. The units will be one and two bedrooms and all will feature exterior decks. There will also be ground-floor commercial space and below-grad parking. This property is located across the street from Shenannigan's in South Boston. These Irish developers own Shenannigan's, the parking lot and apartment building next door, the Clock Tavern a couple doors down, as well as several other buildings in the area. 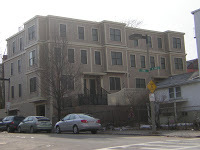 South Boston CondoTheir most recent project was four townhouse style condos at 257 West 3rd Street, pictured to the left. These unique condos sold quickly in May 2008 from $599,000-$635,000. The finishes were high end and all four condos had roof decks, 3 levels of living space, and 2 garage parking spaces. The new project, which I assume will be completed in early 2010, won't have to look far for comps. There is a new 9 unit condo building located at 345 West Broadway that was just completed by another developer. Those condos are not selling well as only one unit is under agreement. The average asking price is around $400/sq. ft. Prices range from a 1006 sq. ft. with 2 beds/2 baths and 1 parking space for $449,000, to a Penthouse which is 2360 sq. ft. with 3 beds/2.5 baths and 2 parking spaces for $899,000. I expect to see some price drops in the coming weeks. If you are interested in either of these developments or any condos in Boston, shoot me an email and I can get you more details or answer any questions. Last updated April 25 at 12:02 am.